Elearning! 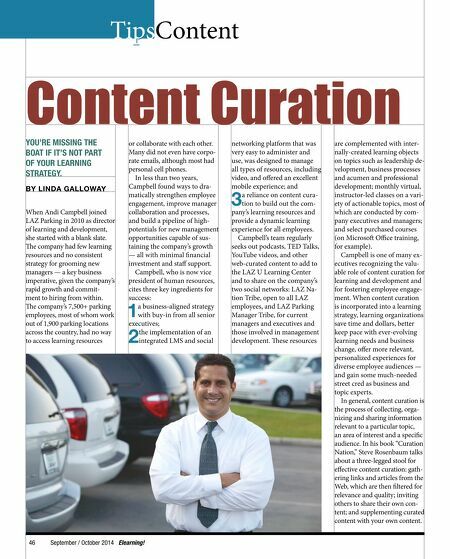 September / October 2014 47 Curated content can be used as resources affiliated with a formal learning pro- gram; for discussions and as- signments in a coaching pro- gram; to keep employees and peers up to date on relevant business events; to capitalize on internal subject matter expertise; for sharing winning best practices. And that's just for starters. While we all curate content to some extent (sharing that New York Times article on Facebook or Twitter counts), professional content curation requires a range of learned skills spanning online research, analytics, technology, informa- tion organization and commu- nication. Curators must have a solid understanding of the topics involved in research, so they can discern relevance and quality and can add meaning- ful context to curated resourc- es. Curators should also have an understanding of the law, ethics and business best prac- tices for content sharing. And, because part of the job should involve encouraging content sharing and commenting from others, curators need to under- stand the human dynamics in- volved in information sharing and collaboration. Following are several basic considerations to keep in mind as you begin to formalize the role of content curator and in- corporate shared content into your learning strategy: >> Always add context to shared content. Don't throw out a bunch of article links, podcasts, or Power- Points and expect employ- ees to automatically relate the information to their jobs or the business. >> Vary the content you share in terms of content type, source, length and perspec- tive. It's also a good idea to mix up evergreen content — that which doesn't go quickly out of date — with news-based content, which typically has a relatively short shelf life. Be sure to include in your content mix internally created content and imagery. By varying content, you'll establish yourself as someone who has a pulse on the business or particular topics — and you'll keep your audiences interested. >> Filter content for quality and relevance. Tis is huge- ly important and one of the primary values of efective content curation. By demon- strating that you know your audience's needs and inter- ests, you're saving everyone the time of doing their own wide Web searches, asking around for that sales deck everyone has been talking about, or digging through manuals to fnd an answer to a customer's technical question. By focusing on quality content, you're also establishing yourself as an informed authority. >> Take advantage of content discovery, aggregation and fltering tools. Many free or inexpensive tools can help you fnd, flter and even or- ganize content fnds. Google, Feedly, Newsly, Scoop.it and IFTTT are just a few ex- amples. Te right combina- tion of tools depends on your goals and needs. Some tools even automate the sharing of content. It may take you a couple of hours to evaluate the oferings and do the re- quired set up, but you'll save hours and fnd content you'd likely never discover on your own. >> Make sure your enterprise technology facilitates all aspects of content sharing. Ideally, your LMS and so- cial learning platform make it easy to upload any kind of content — including videos — and don't restrict who can share. (If upload and sharing rights are avail- able only to administrators, you'll not be successful in creating a sharing culture.) Additionally, your solutions should make it easy for us- ers to fnd and flter shared content of all types. >> Make it mobile. As you're planning your content cura- tion and sharing strategy, be sure you include a way to ofer an optimized mobile experience for your users. And you yourself will want to have the ability to share newly discovered content from anywhere, at anytime. Tis article merely scratches the surface of what is sure to be a very important role for learn- ing organizations in the coming years. Don't miss the boat. 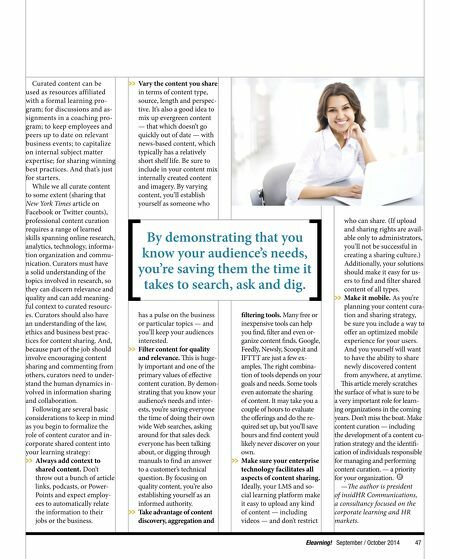 Make content curation — including the development of a content cu- ration strategy and the identif- cation of individuals responsible for managing and performing content curation. — a priority for your organization. —Te author is president of insidHR Communications, a consultancy focused on the corporate learning and HR markets. By demonstrating that you know your audience's needs, you're saving them the time it takes to search, ask and dig.